Compare prices from several car hire companies in Madrid Airport and find the best price for car rental. Our prices always include unlimited mileage and insurance. Madrid-Barajas Airport (MAD) is about. 12 kilometers outside of Madrid and is associated with the city by a metro system. By car you can follow the A2 East, turn left on N-100 and then swing to the right just before the M-14 becomes M-13. It is possible to take the airport shuttle, rental car or take a taxi from the airport. 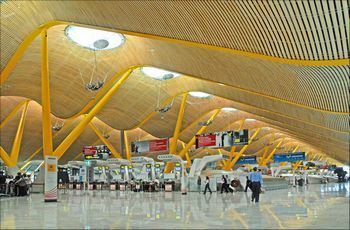 Madrid-Barajas Airport is the country’s largest airport and approx. 50 million passengers were registered here in 2008. This figure did airport to Europe 4 busiest and the world’s 11th busiest. Airlines that live here include American Airlines, Turkish Airlines and Iberia. It offers flights to cities throughout the world as Dakar, Dallas and Moscow. The airport offers shops, restaurants and bars as well as banks, chapel, and playroom.